You can make easy, fun and unique crafts for your baby's nursery! Waiting for your baby to arrive while you're pregnant can feel like FOREVER, but one way to take your mind off the wait is to delve into decorating your baby's nursery. I have an easy project idea to decorate your baby's room: A hand painted picture. In my example we did our baby's initial, but you can paint whatever design you feel inspired to! All you need is to visit your local craft store. You need a blank canvas (any size! ), at least 2 paint colors (I used 3) and some ribbon. 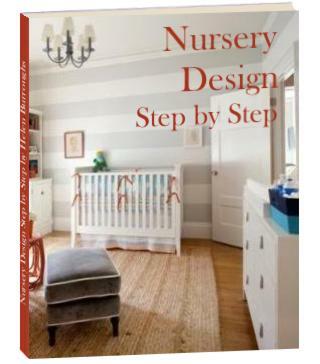 You start by painting the canvas (try to incorporate nursery design themes and colors). Once you've achieved your design,let the paint dry. Then attach the ribbon to the back so you can hang the painting on the wall. We hung ours above my baby's crib! So cute & unique and I cannot tell you how many compliments I've gotten from it!